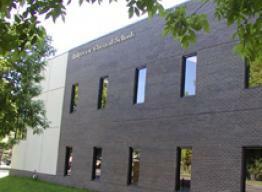 Ridgeview Classical Schools is a K-12 classical, liberal arts charter school serving roughly 800 students. The school employs the Core Knowledge sequence in the elementary school, and a classical curriculum in grades seven through twelve emphasizing small class sizes, Socratic discussions, and the reading of core texts. Ridgeview employs teachers with subject-specific degrees and offers three weeks of teacher training every August for its entire faculty as well as ongoing training throughout the year for new teachers to ensure that students are exposed to teachers who are passionate masters of their disciplines. At Ridgeview, the academic education provided to every student is as important as the character education, a point Ridgeview stands behind through a rigorous curriculum and forthright discussion of the virtues in and out of the classrooms. Elementary K–6 programs include fully implemented Core Knowledge sequence; character education; explicit phonics program; cursive program; ability grouping in areas of reading and math; grammar and writing; Greek and Latin languages; art; karate; music; and physical education. Intermediate 7–8 programs include Core Knowledge curriculum; character education; instruction in Latin and Greek daily; and electives in band, choir, orchestra, P.E., theatre, and computing. High School 9–12 programs offer Classical curriculum: the classics of Western literature; primary sources in history; emphasis on concepts in math and science; required semester of Latin; modern languages taught by native speakers; moral philosophy; a wide array of other electives ranging from engineering to anatomy and physiology to political philosophy. Students at Ridgeview participate in a wide offering of local district varsity sports as well as various club sports and other activities.